Our mission is to enable our students realize their potential and make their dreams come true. This mission is achieved by our guiding philosophy of “Academics First” and “Student-at-the-Centre”. Hence, basic to its core beliefs on educational philosophy, Indus World School follows the “Student-at-the-Centre” and “Academics First” approach to achieve academic excellence. We understand and acknowledge that the individual attention to and recognition of each student in an optimal student-teacher ratio environment, and the development of sound personal values is critical to achieve the goals of the school. Indus World Schools are the beacon of a well-rounded education blending differentiated instruction, well thought-out curriculum and technology integration into every class. The Indus World School way-of-learning is centered around the student. The student’s participation, experience, voice and opinion matter to us the most. We believe that young students learn differently at different stages of life. Our curriculum is tailor made to fit the learning needs of young students at varying stages of growth. Indus World School student passes through three distinct phases of learning, which we at Indus have termed – Ananda, Jigyasa and Sadhana. We believe in the age old saying, ”I hear – I forget, I see – I remember, I do – I understand”. 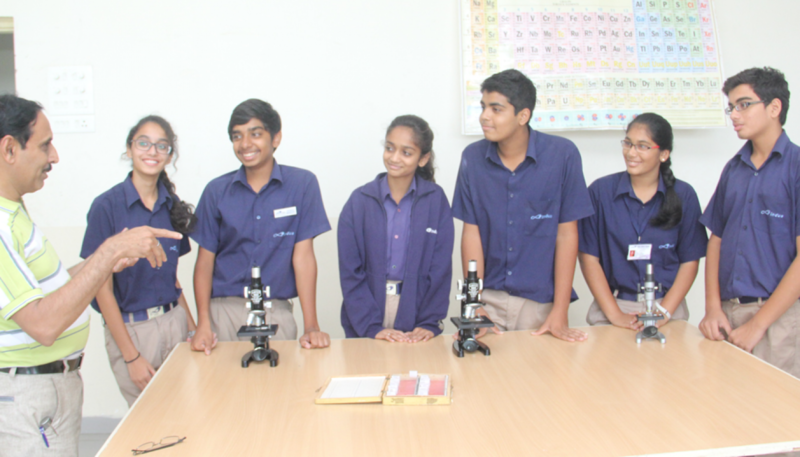 Learning by doing, or experiential learning, is the methodology followed at Indus World School. Central to the approach is the creation of active experiences that encourage and facilitate the asking and answering of questions and lead to the beginning of understanding.